US rail traffic is outstanding! 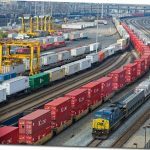 Railroads originated 1,099,000 intermodal (shipping) containers in April, up 6.8% Y-o-Y and the 15th straight Y-o-Y intermodal increase. Moreover, weekly April volume was the third highest ever, and for the seventh straight month intermodal volume was the highest ever for that month! As for rail carloads (think commodities that are dropped or poured), April volume was up 3.3% Y-o-Y, and the best April since 2015.